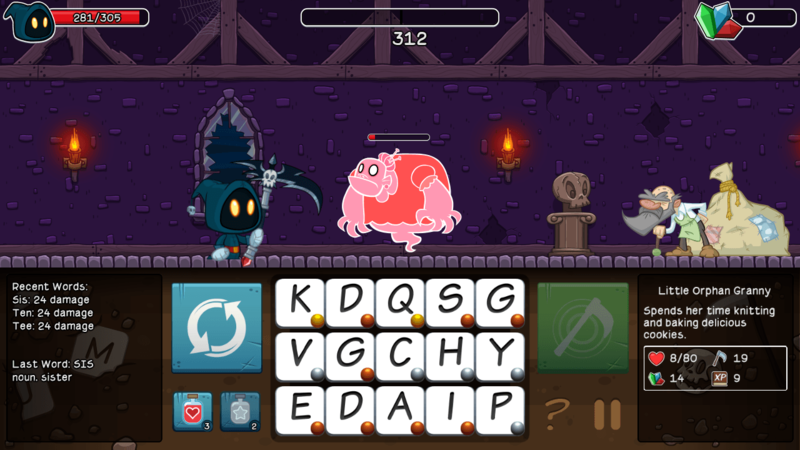 Letter Quest: Grimm’s Journey is one of two fun little word games created by developer Bacon Bandit Games. Thanks to the team over at Bacon Bandit, I was able to get my hands on a review copy for all you loyal TVGB readers out there. Without wasting too much time on introductions, let’s jump into the review. In Grimm’s Journey the player takes control of Grimm, a cute looking grim reaper that’s short in size but has quite the large… erm… vocabulary. The game tries to take the core feature of Scrabble and combine it with lite RPG elements, such as upgrading your weapons and buying health potions to help you along your Grimm Journey (see what I did there?). To my surprise the game actually pulls off what it’s going for in most aspects. Grimm’s Journey is little light on story, which can be expected from a word/puzzle game, but I personally thought that a few cutscenes here and there would give the player better insight into Grimm’s motivation for trudging along through his sometimes tedious quest. Basically Grimm is in search of a nearby pizza joint, and that is the entirety of the story. This is where things get interesting in my opinion. I often fancy myself a wordsmith, but Letter Quest Grimm’s Journey had me second guessing myself. Don’t worry, I still think I’m a wordsmith of course, I just also happen to believe this game is too hard for it’s own good. The game features unique tiles that can hinder the player’s progress, like the infected tile, which spreads to other tiles and infects them. Then when you need to use an infected tile the game punishes you by causing Grimm to take major damage. That might not sound so bad by itself, but if you couple that with a monster that can only be hurt by words that begin with a vowel for example, and you start to the visualize the masochistic picture I’m trying to paint here with these words. The game does feature a currency system in the form of crystals that you can exchange at the store for various potions and power-ups that make the game a little less gruesome, and after taking full advantage of the stores wares, I was able to progress onward once more towards eternal damnation glory. Letter Quest: Grimm’s Journey uses a cartoony art style that actually works quite well, and I can see the appeal and reasoning behind it. The game has to be accessible to as many demographics as possible, and even though I’m a true survival horror fan, I know that a realistic looking Grim Reaper slaying all sorts of baddies and turning them into viscera probably isn’t appropriate for everyone, and that’s fine. It also includes a pretty awesome soundtrack for those of you that appreciate retro gaming soundtracks. It’s not a chip tune or anything like that, but it definitely has a kind of Zombies Ate My Neighbors sound to it and that’s one of my favorite games in the history of ever. 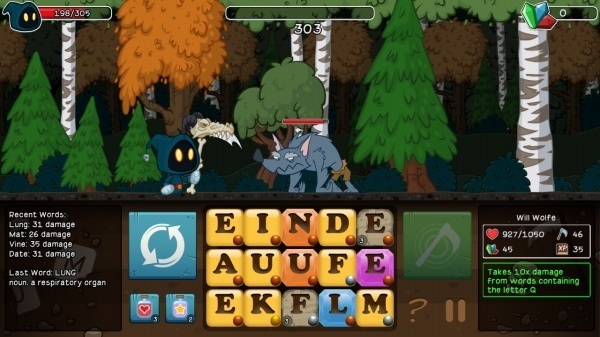 Letter Quest: Grimm’s Journey is an entertaining spin on the word game genre with an excellent soundtrack and RPG elements. But some of the gameplay mechanics, such as the various tiles that hinder your vocabulary, really kept the game from being great. It’s definitely still fun to play, just be ready for some mild frustration.